The mayor of the state’s largest city says a sales tax hike may be needed to help fight crime, while they wait for state lawmakers to pass a state budget. 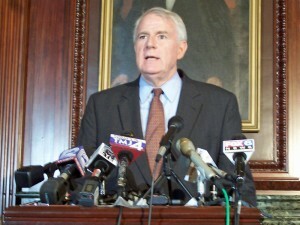 At a public hearing on Milwaukee’s proposed city budget for 2018, Mayor Tom Barrett asked that the state allow the city to adopt a one-half percent sales tax to help prevent the need to make “steep cuts” in both police and fire personnel. Barrett said he wants to put the sales tax to Milwaukee voters next April, with the goal of keeping it in place for the next four to five years while the city works to close its budget gap. Barrett has previously warned that the city might have to cut 84 police officer positions next year, something he repeated Tuesday night. He said the city can no longer rely on general state aid and property taxes to keep emergency services going.